"This is Ted at 6 years old. He was given to us as an 8-week-old pup when we lived on the farm to work sheep, which he did extremely well. We have always had Kelpies, but found the Huntaway more useful, particularly in the yards. Bred by Mr. & Mrs. B. Smith of Quirindi. He is extremely loyal. A one-man dog, but still loves other people. He is very smart, easy to train, loves chasing sheep and the ball, loves sleeping inside and lots of pats and cuddles. He gets clipped each summer. Now he is a city dog as we moved from the country. He jumps the park bench seat on command. He can find a lost ball in the park by following arm signals. He needs lots of exercise to keep trim. He barks a lot and can be very loud. Ted is the best dog we have ever owned and we love him dearly!" The New Zealand Huntaway comes in various shapes, sizes, colors and hair-coats. Some of these dogs are very big and some are very small. For the New Zealand Huntaway fanciers, the look of the dog is not as important as its working ability. The New Zealand Huntaway is a very unique sheep-herding dog, in that it uses its voice to drive the sheep. The dog leans to gather the herd and follows behind it. Special events were developed for these dogs at sheep-herding trials. The events were referred to as "huntaways," and eventually gave the dog its name. Usually good with children and fairly easy to obedience train, the New Zealand Huntaway is an intelligent dog. They are usually good with non-canine pets. The New Zealand Huntaway is friendly with strangers. They are not guard dogs and some are not good watchdogs. Because they were bred as a barking-herding dog, they need to be trained when to bark and when not to bark. These dogs are very intelligent, so this is not difficult to do. One owner says, "They actually only bark when they are being worked. They have been trained to keep quiet and to save their voice for working. So this trait can be trained out of them. My husband has even come up with separate commands to send his dog on outruns with either voice or no voice. They aren't just intelligent; they are extremely intelligent." New Zealand Huntaways need an owner who is calm, confident and consistent, making the rules clear and sticking to them. This dog should not be permitted to bark at you when he wants something, as this is allowing the dog to engage in a dominant behaviors. This is a very general size range; the New Zealand Huntaway comes in various shapes and sizes. New Zealand Huntaway tends to be fairly healthy. The New Zealand Huntaway will do okay in an apartment if it is sufficiently exercised. This dog can live and sleep outdoors as long as it has proper shelter. This is a very active dog, originally intended as a working dog; therefore it needs plenty of exercise. It needs to be taken on a daily, long, brisk walk or jog where the dog is next to or behind the person holding the lead. Never in front, as instinct tells a dog pack leader goes first. In addition, they will benefit from a place to run free in a safe area. Comb and brush regularly with a firm bristle brush. Bathe or dry shampoo only when necessary. These dogs are average shedders. 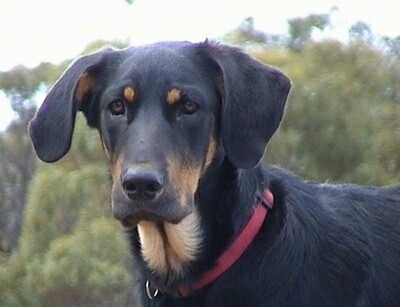 The New Zealand Huntaway originated in the 1900s. While most of the original British sheepdogs transported to New Zealand worked the sheep silently, an occasional dog would work them with his voice. Some shepherds were intrigued with this, liking what they saw in the voice-driving sheepdogs. Selective breeding of the barking sheep-herding dogs and many other breeds were crossed to get the characteristics that were desired. The Black Lab, Hound, Border Collie, German Shepherd Dog are just a few. Many more breeds were included in the genetic makeup of these dogs. This breeding process proved successful, resulting in the New Zealand Huntaway, a breed that urges sheep forward with its voice. The New Zealand Huntaway breeds true for the intended purpose of sheep herding. 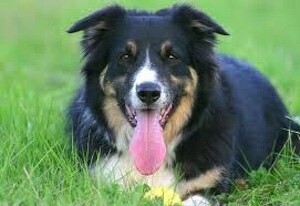 It has been exported to Great Britain, where it participates in field trials and works as a sheepdog. It is becoming increasingly popular as a companion dog. 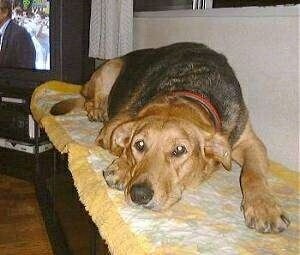 Currently there is a NZ Huntaway Club starting in Japan. 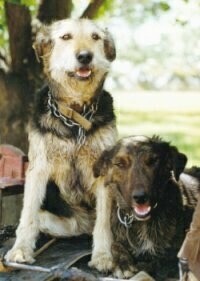 Regardo is a bearded Huntaway who works on a dairy farm. 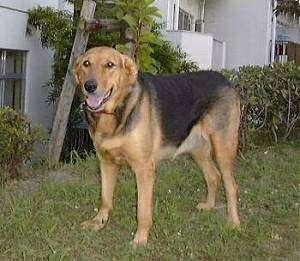 "Jayda is a Huntaway dog shown here at age four. She is a working farm dog on a dairy farm. Her calls are: “Way back,” “walk up,” “in behind,” “speak up,” “on the bike,” “stay,” “run” and “follow up.” She was raised by hand from a pup, as her mother killed all her pups but Jayda." New Zealand Huntaway puppies—this is Jimmy (in the background) and his sister Jade (in the foreground); they are around 6 months old. They were adopted from a farm when they were 7 weeks and they now live in town with their owners.